These are some notes on my project (together with other members of the Midwest VHF/UHF Society) to convert the MaCom 10GHz "White Box" (or "Whitebox" for the search engines) unit for ham radio use. Since we're following in the path of others who've already modified these units, there isn't much new here in the way of modification instructions, but I've done a lot of evaluation of the unit and hopefully the performance data presented here will be useful. There are two source documents that virtually everyone converting the White Box uses. The first is a paper by WA6CGR that was published in the 1991 Microwave Update. It's available several places on the web, but I have put a copy of Dave's paper (in PDF format) here. The second conversion document is by G3PHO. The current URL for Peter's paper is http://www.g3pho.free-online.co.uk/microwaves/whitebox.htm. I also have a .zip file of Peter's material here. These documents are interesting to compare because each focuses on doing fairly extensive mods to different parts of the White Box unit. But neither one does much in the areas that the other hacks on. You can apply mixer theory to these papers and do a conversion that's the sum of the changes both Peter and Dave made (i.e., lots of work), or the difference (i.e., not much work at all). Our group took the simple approach and didn't do any major modifications. We just retuned the existing circuits, and used "high side" LO injection which avoids a major retuning of the local oscillator module at the cost of living with a reversed sideband and tuning direction compared to those who use the more complex LO modification. I've spent most of my time on this project characterizing and optimizing the local oscillator's frequency stability. 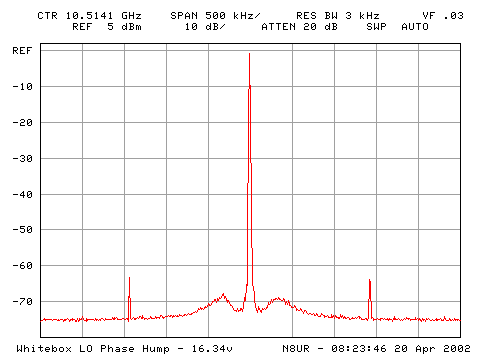 See http://www.febo.com/time-freq/whitebox for details of my experiments, and plots of the LO frequency stability. The LO requires 18-20 volts for operation. Since I want to take my 10GHz rig out on the road, I'd like to be able to run the whole system from a 12 volt power supply. Again, both the WA6CGR and G3PHO papers have different approaches to doing this. 'CGR suggests a circuit using an LM317T audio amplifier module as an oscillator running at 20kHz. Dave then rectifies the output to provide about +24 volts, which is regulated down to 18V. A separate rectifier driven from the same signal provides -5 volts for the transmit amplifier bias. I first built the LM317T circuit, but found that it was very inefficient (well under 50%) and also had a lot of high frequency noise on the output. I figured that in the end I'd figure out how to filter the noise, but the temperature of the LM317T heatsink convinced me this wasn't the way to go. Then I built the G3PHO design, and am very happy with it. I'm measuring -- hard as it is to believe -- greater than 90% efficiency and the LM2577 heatsink remains stone cold after hours of operation. The current drain from a 13.8V supply is about 375ma (when the crystal heater is at operating temperature -- the starting current is about 700ma but drops pretty rapidly). 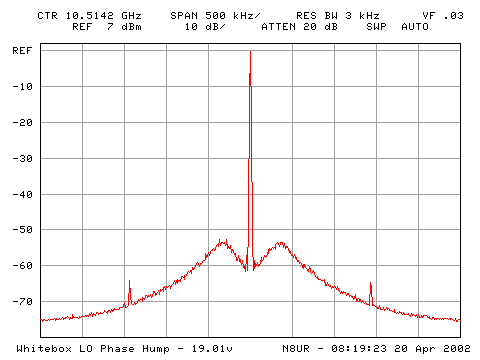 By contrast, my LM-317T drew over 800ma and the idle current is quite high. The LM2577 circuit uses one somewhat expensive component, a high-quality ferrite coil that provides energy storage. Peter's design used a 100uH coil, but my back-of-the-envelope calculation from the data sheet showed that a 300uH coil was more in line. I used a Schott 67127080 (available from Digi-Key) which cost about $13.00. The local oscillator has an AFC input which (a) creates noise if it's left floating, and (b) may need to be biased to allow the crystal to tune to the correct frequency. I built an AFC bias circuit on the power supply board. It's simply a 12 volt zener diode driven from the regulated +20 volt output, and fed into a 10k cermet pot which allows fine frequency adjustment. To minimize sidebands, I also put a 22uH inductor in series with the AFC output, but it made no noticeable difference and probably isn't necessary if you adequately filter the main supply. Figuring out the right voltage to put on the AFC pin has been a bit of a challenge. G3PHO uses a 3.3 volt zener, but we found that our units ether wouldn't net to frequency, or start oscillating reliably (or both), with that voltage. I suspect that different crystals may require different AFC voltages to land in the right spot. I'm running about 9 volts and that seems to put the trimmer cap near the middle of its range to yield the desired frequency. We noted that the LO is very sensitive to supply voltage -- a 1 volt supply change results in a 40kHz change of output frequency. G3PHO suggested that separately regulating the oscillator transistor inside the LO could reduce a slight frequency shift he noticed switching between RX and TX, and I decided this might help the overall stability of the unit. Rather than using a 3 terminal regulator as G3PHO did, I used a 15 volt zener diode. The installation is very simple. If you open the top of the LO and look in the corner near the frequency adjust capacitor, you'll see two resistors mounted near the bottom edge of the board (with the box aligned so the crystal is in the upper left quadrant, they're mounted running north-south with the trimmer cap above and to their left). One of them is 100 ohms. Remove that resistor and install one end of a 330 ohm resistor in the now-empty hole near the bottom of the board, and a short piece of insulated wire in the other hole. Mount a solder lug on the mounting screw at the lower left corner. Get a 15 volt, 1 watt zener diode and mount a bypass cap of your choice (I used a 1.5 uF tantalum, which on reflection may not be ideal) across the diode. Solder the anode end of the diode to the ground lug, and tie the cathode, the free end of the 330 ohm resistor, and the free end of the wire together. Close up the box, because you're finished. In general, the Whitebox LO does a good job; discrete spurious signals are far enough down that they shouldn't cause any problems. There is one anomaly, though. The -5 volt bias supply for the transmit converter has proven to be another problem. As mentioned above, Peter's circuit uses the ICL7660 voltage inverter chip to turn +5 volts into -5. The 7660 is rated for 20ma output, but will have about 0.5 volt drop when the current is 10ma. You can parallel multiple units to increase the output capacity. I built my circuit with two 7660s in parallel, figuring that would provide more than enough current. It didn't. The bias current in standby mode is about 27ma (which caused the output from my supply to sag to about 4.3 volts). On key down, the current is more than 90ma and the voltage of the parallel 7660s sagged to only a bit more than 2 volts. 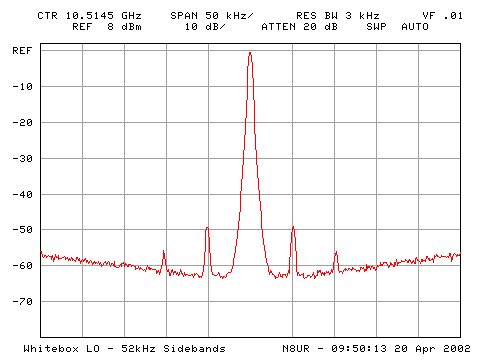 I'm not sure why the bias current is so high, but this was verified on two different White Box converters. After browsing some semiconductor manufacturer's sites on the web, I decided to use a Maxim MAX764 DC-DC inverter for the -5 volt supply. This chip can provide up to 300ma at -5V from a +12 volt input. It's claimed to be 80% or more efficient. The circuit seems to work well, and holds at -5 volts plus or minus a few millivolts through the normal range of loads. The output seems to be very clean, except for a very low frequency (10Hz or so) sawtooth with an amplitude of 30mv or so -- that's small enough that I didn't lose any sleep over it. I built a really simple and very clever T/R sequencing circuit that I found in the VHF/UHF DX Book by G3SEK. There's a slightly earlier version of the schematic on-line at http://www.ifwtech.co.uk/g3sek/dx-book/sequencer/. It may seem old fashioned to use relays these days, but the circuit is simple and does the job. With the relays I used a 470uF cap provides about a 40 millisecond delay between the "fast" and "slow" contacts. This circuit has more delay than is needed for the coax relays I am using (which switch in about 6ms), and in particular the design provides unneeded delay on unkey. However, with only about 35ms of delay on keying and 10ms more than that on unkey, the delay isn't really an issue. Removing the unkey delay would require an extra set of relay contacts that aren't there. If I ever take the box apart I may reduce the timing cap to 270 or 330uF, but I think the current circuit is "close enough for government work." I added one extra safety feature to my T/R switching -- I put a SPST, normally open, 5 volt reed relay in series with the keying line. The relay is driven from the bias supply. If there's no bias, the keying line is disconnected and there's no way to apply +12V to the transmit side of the White Box converter. Better safe than sorry, I say! The White Box has a sensitive input circuit. 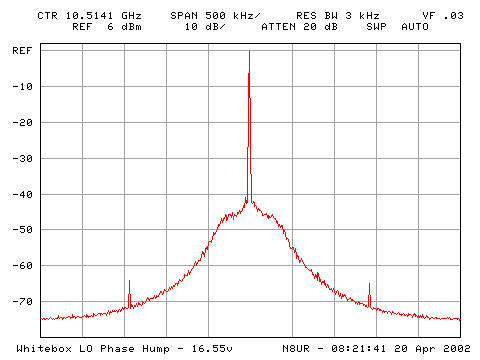 -20dBm at 146MHz seems to be about the right level to drive the exciter to maximum linear output. Above that level, the gain starts to compress and the output is fully saturated at -15dBm drive. I'm getting about +21 dBm (a bit more than 100mw) saturated output. I'm using a Yaesu FT-817 as the IF rig. The '817 can operate either on 13.8 volts or on an internal battery pack. It's rated for 5 watts output on high power, but defaults to a medium power setting that (on my unit at least) puts out almost exactly 2.0 watts at 146MHz. One very nice feature is that this power output remains very stable over a wide range of supply voltages -- switching between a somewhat-discharged internal battery at 9.5 volts and external power at 13.8 volts changes the output only a tiny bit. The FT-817 hooks to a Down East Microwave AOS-144 switching unit which combines a high-power attenuator and an RF-sensed switching circuit to split a single RF input to separate RX and TX outputs suitable for connection to a transverter. 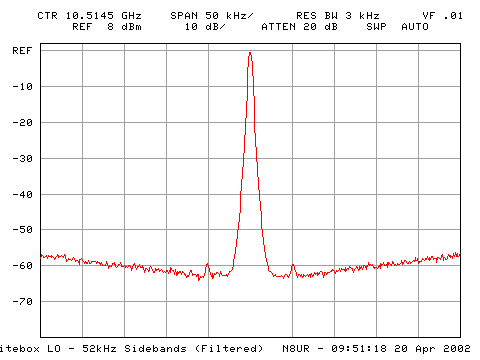 Two watts from the FT-817 yields about +7.9dBm at the AOS-144 TX IF output. A home-brew attenuator in the TX IF line provides about 29dB attenuation, so I have about -21dBm going into the converter. (24 June 2002) John, N8VZW, and I were both at the Bellbrook Amateur Radio Club "Field Day" station this weekend and we made a contact on 10GHz -- my first -- across a couple of hundred yards of parking lot. It was good to confirm that the rig really works! I don't expect much from the receiver at this point, since there's no preamp in front of the input filter and mixer. We have some WB5LUA preamps on order from Down East Microwave and the system won't be complete until one of those is in the front end. A minor problem with any receiver testing is that I don't have a 10GHz signal generator, so I'm going to have to go by on-air experience to see how the RX is working.